The new single from the cellists combines Led Zeppelin's classic song with Beethoven's 5th Symphony. In the new video, Luka and Stjepan show what 2CELLOS are all about – breaking musical boundaries. Of making the video, Luka says, "It was a lot of fun – we wanted to incorporate two different time periods to showcase that our music is timeless and for everyone! It was a dynamic filming situation since we had to clone ourselves from 2 cellists to 4 cellists – talk about being in two places at once!" 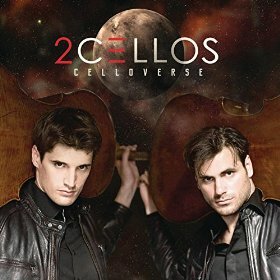 2CELLOS new album Celloverse (Portrait/Sony Music Masterworks) is available now. Self-produced by Sulic and Hauser, Celloverse showcases 2CELLOS' unique ability to reinvent current and classic rock/pop songs, starting with The Trooper Overture a metal-meets-classical mash up of Iron Maiden's hit and Rossini's "William Tell Overture." The album includes their take on AC/DC's Thunderstruck (the video has 57 million views! ), the hit pop song Wake Me Up by Avicii, I Will Wait by Mumford & Sons and Michael Jackson's They Don't Care About Us. Rounding out Celloverse is the Paul McCartney classic Live and Let Die with special guest Lang Lang and the title track, an original song penned and arranged by 2CELLOS.